I sat down a few days ago to write my November Pogrom piece for this year. Rereading last year's, I realised that I couldn't write a better piece than this. This is quite possibly the best thing I've ever written. If you haven't read about what happened to us personally in Delhi during those first few days of November 1984, please go to the link in the sidebar. I very much want to make this real to my readers by telling individual histories of this time. 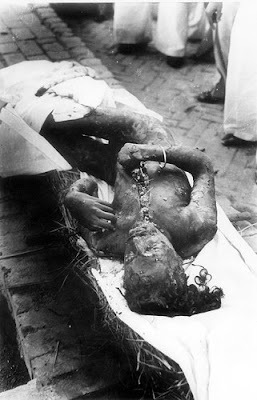 This holocaust did not happen only to the Sikh people, it happened to individual Sikhs. Like me. Who is he? Who is this Singh? I have spent countless hours staring at this photograph asking myself questions. Whose son is he? Whose husband, whose dad, whose brother, whose uncle, cousin, friend? Is someone waiting anxiously at home for him, waiting for a footfall that will never come? Where is he from? Does he live in Delhi or is he just visiting? Where was he born? What is his pind? When was he born? How old is he? What is his occupation? Is he an engineer, a doctor, a professor? Or is he a taxi driver or a trucker? What are his politics? Is he an Akali or a member of Congress? Is he a Khalistani or a Bharata Mata lover? Or is he political at all? Is he just trying to live his life and not really concerned about the niceties of the larger world. Why is he keshdhari? Is it just habit, following family custom? Or is it deeply meaningful to him? Does he pray each day, do naam jap, love Vaheguru? Or are those just incidentals that have fallen by the wayside of his life? Where is his turban? How does he feel as it is ripped from his head and his kesh is exposed? How does he feel as he realises the mob is coming for him, chasing him down the street or dragging him from his home or his car or from the bus? What goes on in his brain as the petrol is poured on him and set alight? What is he thinking as his body burns? Or is he beyond thought? Is he aware of the laughing jeering mob around him, enjoying watching his final agonising moments of life on this earth? What is his last awareness as he dies alone, surrounded by merciless thugs? Questions without answers. Whoever he is, he deserves to be remembered. I doubt he had even a death certificate, so I have made him one. Who was he? Who was this Singh? I have spent countless hours staring at this photograph asking myself questions. Whose son was he? Whose husband, whose dad, whose brother, whose uncle, cousin, friend? Was someone waiting anxiously at home for him, waiting for a footfall that never came? Where was he from? Did he live in Delhi or was he just visiting? Where was he born? What was his pind? When was he born? How old was he? What was his occupation? Was he an engineer, a doctor, a professor? Or was he a taxi driver or a trucker? What were his politics? Was he an Akali or a member of Congress? Was he a Khalistani or a Bharata Mata lover? Or was he political at all? Was he just trying to live his life and not really concerned about the niceties of the larger world. Why was he keshdhari? Was it just habit, following family custom? Or was it deeply meaningful to him? Did he pray each day, do naam jap, love Vaheguru? Or were those just incidentals that had fallen by the wayside of his life? Where was his turban? How did he feel as it was ripped from his head and his kesh was exposed? How did he feel as he realised the mob was coming for him, chasing him down the street or dragging him from his home or his car or from the bus? What went on in his brain as the petrol was poured on him and set alight? What was he thinking as his body burned? Or was he beyond thought? Was he aware of the laughing jeering mob around him, enjoying watching his final agonising moments of life on this earth? What was his last awareness as he died alone, surrounded by merciless thugs? 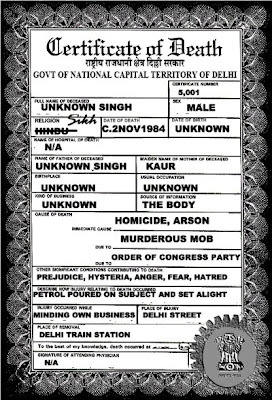 He was our brother and he was one single human being, one Sikh among the thousands murdered during the madness of those days in 1984. He is our brother and he deserves justice. One final, unanswered question: When? I've turned them into a cause. Something to rally around twice a year, and sporadically throughout the year. I've forgotten the individual Sikhs who suffered, who were beaten, raped, tortured, killed, who lost family members in front of their eyes, who were displaced, disappeared, destroyed. I wonder who has been more unjust - me, a proclaimed fellow Gursikh who has not reached out a hand to my suffering family, or the perpetrators of these hideous atrocities who are expected to treasure their own filthy skins above all else. I wonder who will be judged more harshly in the court of God. I wonder what they must think of people like me, chilling abroad and making raulaa every once in a while, 'never forget'ting 1984. Your deeply compassionate heart is showing. I am certain that your level of commitment has grown - and you will do what you have not done before. You are not bad and have done nothing evil. You just needed to be reminded. And that means I have done my job, at least in part. That is a graphic image. But they are everywhere nowadays, aren't they? It's like we see them every other day, and we get used to them. Till it comes to the point where we no longer think of them as humans. They're just images. Is that how politicians see them? As for those who do this kind of thing, I wonder if they start off with killing chickens first, just to get used to the horrifying site of watching someone die so gruesomely then come to do it to cats, then to human beings. Gradually. Or does it just take enough brainwashing to make a person jump from the state of freaking out at the mere sight of blood to actually slashing someone's body or burning it? A long jump. Gosh, how annoying! I hate feeling so hopeless. Actually impatient. Come, change, come! Will it be a universal revolution, of the French kind? Or a gradual change? Hi, dear H. Maryam ji! As usual, your comment brings a smile to my face. For all our differences we are much alike, I think. I can answer one part of it. Some - not all, but some - of those who attacked were neighbours, even friendly to those they kill. In the frenzy of mob mentality, we humans often become our worst selves. It was different for us defending ourselves. We knew exactly what we were doing and why and did the necessary. I who feels bad at killing a mosquito - don't talk about killing a chicken - was able to easily cut a "man's" throat nearly decapitating him and lick his blood from my lips, feeling satisfaction and no guilt, even today. I have no idea when or how it will end. We shall have to wait and see.